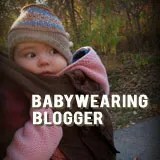 Let’s start with the discussion of babywearing safety. Statistically speaking, a baby in a baby carrier or a baby in arms is always safer than in any other piece of nursery equipment. Though there have been tragedies, far more tragedies have occurred in other nursery products. Not only is baby safest in your arms, but you and your baby will reap all of the social-emotional, cognitive, and physiological benefits of babywearing. Car seats that snap in and out of cars and into swings and strollers, used as sleeping devices outside of the car, etc. are becoming quite the norm…as is positional plagiocephaly/brachycephal, from mild to severe cases, directly related to babies spending too much time in those infant car seats and swings which have a sloping back and place pressure right at the neck and base of the skull. In addition to cases of plagiocephaly, there are articles readily accessible through a simple search on the AAP and JAMA websites stating that, from a medical perspective, car seats should be used only in the car. Studies have shown that, even in healthy, full-term infants, oxygen saturation rates have dropped to an alarming rate when babies spend too much time in a car seat and other inclined infant seating devices. Hypoxia is a real concern and can be alleviated with proper positioning in baby carrier or in a caregiver’s arms. There’s nothing wrong with these products, and many babies love them, parents need to put baby down sometimes. But, in the end, the more time babies spend out of these containers and in parents’ arms or in a baby carrier…the better! And that means ANY baby carrier – even a harness carrier. Ideally, baby should be in an ergonomic position for both him/her and you, the wearer. Forward facing “in” with hips in a spread-squat position is really the most appropriate carry for a young baby, especially a newborn. Besides the importance of preserving and supporting the infants natural C-shaped spine and spinal development, facing inward allows the wearer to really tune in to the needs of baby, and for baby to get all of the social-emotional learning benefits from being in the caregivers’ arms. In fact, even studies of strollers have shown more positive interactions and social-emotional growth in babies who are in strollers that allow the seat to face the caregiver pushing the stroller. Once baby is older and wants to see more of the world, the hip carry position becomes very popular, as well as the back carry (usually when baby can sit unassisted). After 20 lbs. or so, the back carry really is the most ergonomic carry for you, the wearer, and a forward facing out carry, whether you prefer the position or not, is just not comfortable or ergonomic for long periods of time. The benefit of the back carry is a truly hands-free experience, as well! I’m not a fan of the FFO position, personally, especially for long periods of wear, mostly because of how much it throws off YOUR center of balance, as the wearer. By the time baby is old enough to be in the FFO position (babies without total head control should not be placed in a forward facing position), their weight is usually a bit prohibitive of long-term comfort in this position. However, if your carrier allows the FFO and you find that you’re in a position where you want to be able to turn baby around and show him/her something (i.e. you’re viewing a puppet show, a performance at the park, etc. ), I understand parents using this function of the carrier to do the same thing you might do if you were holding baby in your arms. When you go back to walking around, though, it’s best to turn baby around, not only to return baby to a more ergonomic position, but also to avoid overstimulation and provide him/her with the comfort of being able to take a break from everything “coming at him/her” as you make your way on your journey. There is still no evidence that this FFO positioning causes hip dysplasia, though it certainly isn’t a hip/spine healthy position, especially with younger babies. I do want to add that the linked page and image from the Hip Dysplasia Institute have been taken out of context and manipulated at times to make the claim of causation, and it’s just not there. If you visit the IHDI yourself, you will read that the narrow-based carriers are merely not recommended, as the goal of the organization is to promote hip healthy practice in all situations. And, if you actually go on to read the text on that page and others, you will find that hip dysplasia is understood to be a developmental condition linked to positioning in the womb, family history, and other conditions. It is NEVER said that you can cause hip dysplasia from wearing the wrong type of carrier. If, however, your baby has risk factors or shows symptoms of hip problems, then those carriers are not recommended. There is no evidence that any particular type of carrier will cause hips to dislocate. Some older research does exist where hip dysplasia rates were investigated among a few communities around the world. Communities that carried babies in positions where legs were spread and hips abducted had lower incidences of hip dysplasia, where others that used tight swaddling of the body and legs had slightly higher rates. However, there is still a genetic component and/or predisposition based on other factors that must be considered. Moving beyond the whisper-down-the-lane hearsay that has been passed, with much hostility, around babywearing circles as gospel truth that FFO positioning can directly lead to hip dislocation and hip dysplasia, I’d like to point out that what is often left out is that hip-healthy advocates are advocates for life-long hip health and are not interested in fear mongering. Beware of those who will cry “crotch dangler” and threaten hip dislocation without a broader knowledge base when it comes to the subject. My training with Babywearing Institute has brought up the important issue of considering, not just the hips of the baby, but preserving the hips of the adult and aging person, as well. The goal is not to vilify parents who use carriers that allow for forward facing out, but to strive for ideal positioning from early on when the hips are still developing (even if we don’t always achieve it) with the best intention of having far fewer people – babies, children, adults, and elderly persons – suffering through hip conditions.